I have a secret. 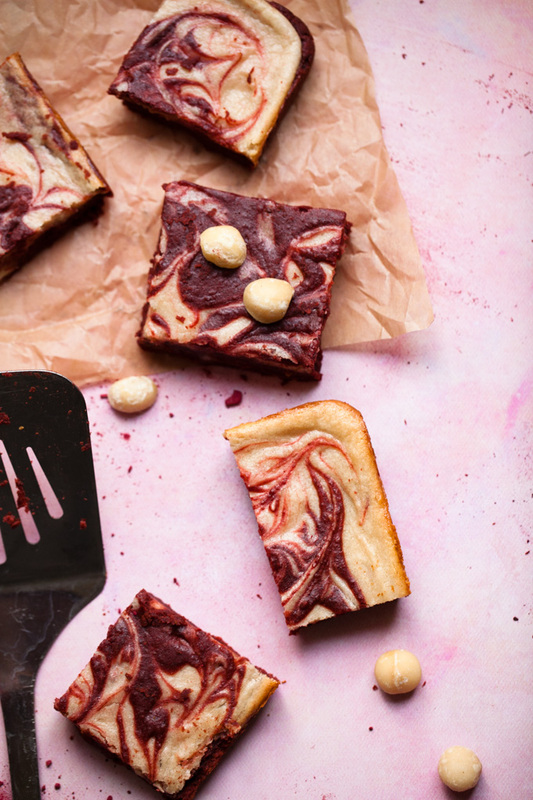 These vegan red velvet cheesecake brownies are healthy. Not just “not that bad for you” but actually healthy, especially for a dessert. I know what you’re thinking, there’s no way a red velvet cheesecake brownie could be good for you. But these actually (kinda) are! Not only are these beauties fully vegan and gluten-free, they’re packed with protein and mostly naturally sweetened. Plus they are made with beetroot powder for the deep red color, so that makes them practically a salad. What I’m trying to say is that I ate nearly the whole damn pan! While I definitely do not recommend eating the entire pan of these, a square or two (or 5!) of these vegan red velvet cheesecake brownies will not set you back on your health and fitness goals. Now that’s a holiday dessert you can feel good about! The best part? These babies taste absolutely sinful but don’t give you that awful sugary gross feeling from eating too many sweets. I must warn you, these vegan red velvet cheesecake brownies are super addictive. As I type this, I’m trying to resist eating the last of the pan in the fridge. I promised I would save some for my husband to take to work. We love to share our yummy food with people so they know firsthand how delicious vegan food can be! If you try this recipe, please leave us a comment and tell us how you liked it! And snap a pic of these beauties and tag it with #carrotsandflowers on Instagram so we can admire your lovely red swirls! IRRESISTIBLE Red Velvet Cheesecake Brownies that are actually good for you! Vegan, gluten-free, and full of protein. You won't be able to eat just one! Soak the cashews for two hours or overnight, or boil for 10 minutes to soften, then drain. Preheat oven to 350 degrees F and spray a 9x13 inch pan with nonstick cooking spray. In a food processor, add all red velvet ingredients except for the macadamia nuts and process until batter is smooth. Stir in the nuts and pour the batter into the prepared baking pan, saving 1/4 cup of the batter for the top. Add 2 tbsp maple syrup to the reserved red velvet batter to thin it out, then dollop the remaining batter over the cream cheese layer. Using a skewer or the tip of a knife, drag the tip through the cream cheese mixture to create a swirl pattern. Bake the brownies for 30 minutes. Remove to a cooling rack and allow them to cool completely before cutting. *Brownies will keep in a closed container in the fridge for up to 5 days. *The beetroot powder smells kind of strong in the batter. When they bake, you will not be able to taste or smell it! *Macadamia nuts may be swapped for walnuts or pecans, or omitted entirely. If you enjoyed these vegan red velvet cheesecake brownies, be sure to check out our 3 Layer Vegan Red Velvet Cake with Macadamia Cookies or our Raw Vegan Strawberry Cheesecake! To save this recipe for later, pin the photo below! 1/4 cup sugar plus 1 cup agave/maple syrup is more sugar than I prefer. Just want to make sure that’s correct — or if there’s any suggestions for lessening ?? hi – is this baking powder or baking soda? just need to check before I end up with a biscuit! Just made them! And I am so in love. Recipes like this are the reason more and more people will understand that being vegan is not pitiable, not at all. 🙂 thank you!